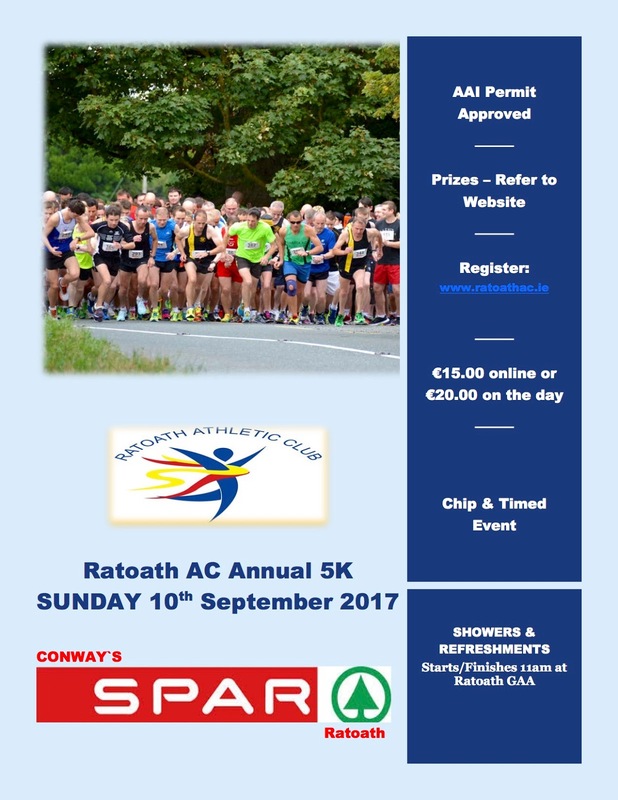 Ratoath AC 5K Details Sunday 10th of September 11am Start finish at Ratoath Gaa club. One day to go race day, here's the latest information regarding registrations and number pick up. **Online registration is now will closed online registrations is no longer available. Pre-race number pickup and €15 race registration is available this evening (Saturday) in Conway’s Spar, Fairyhouse, Ratoath from 6:30-8pm. Save race day time and pick up your race number and register early. Number pick up and €20 on the day registration available Sunday Morning from 9am-10:30am sharp in Race HQ. Registrations cannot be processed after 10:30am on race day. 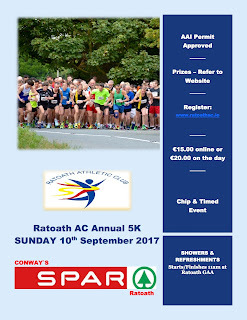 This is also where registrations and number collection will take place before the race, and the famous post-race refreshments, award presentations, raffle, post race showers and complimentary massage from Edel and her team from Ratoath Sports Injury Clinic will be on hand to give a post race rub down. Community team competition, cups and prizes for the local businesses who have sponsored a team. There will be an Athletics Club team prize and cup for the first ladies team and the first men’s athletic club team 4 to score on each. Category prizes for Jr Sr, O40,O50,O60 male and female. *Run Hub will have a stall with running gear for sale and voucher for the raffle.